Methods of the current research are based on the nodes degrees distribution analysis. Information about the United National Electricity Grid (UNEG)—Russia’s power transmission grid is used in the paper as a source of empirical data about power grids topology. As a result of the analysis, we get a conclusion that universal models of complex network theory are not applicable to the UNEG modelling. Nevertheless, the creation of a compound model, which generates networks with nodes degrees distributions similar to the negative binomial distribution, is promising. The analysis of the UNEG nodes degrees distribution helped us to identify the key principles for a compound model. According to these principles, we chose from the ad hoc models of power network formation the Random Growth Model (RGM) as a good base for creation of the compound model. However, the RGM has a significant flaw in the mechanism of formation of transit nodes in a power grid. We found a way to fix it by adding to the RGM an intermediate phase of network growth, which occurs between the phase of global optimal growth and the phase of self-organized growth. 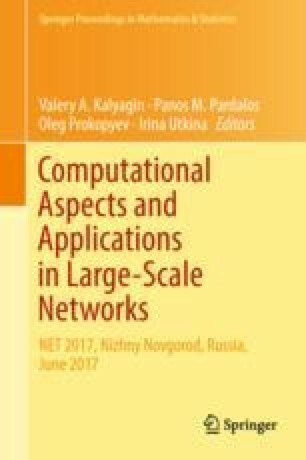 A new’project’ stage of network formation could correctly depict the formation of transit nodes, which are created in large-scale projects of long power line routes creation.